Club Penguin Cheats by Mimo777 Club Penguin Cheats by Mimo777: Come On, Let's Do The "Chattabox" Conga! Thank you so much to everyone who joined me last week to help collect coins and donate them to Coins for Change. We made some huge trains and collected thousands of coins. 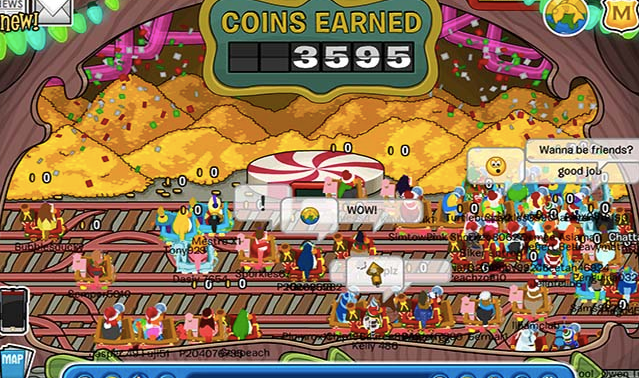 Check out the picture below where one of the trains collected 3595 coins – good job guys! So it's almost 2014 – how exciting. Let's have a celebration to bring in the New Year, I'm thinking a conga party! So come dressed in your favourite outfit from 2013 and we'll conga around Club Penguin island to celebrate the beginning of 2014 – it's going to be an AWESOME year in Club Penguin. Lets meet in the Forest on the Down Under server at 4pm (East Australian Standard Time) on Thursday 2nd January, which will be 6pm for all of you in New Zealand. Don't forget, this is 9pm Penguin Standard Time on Wednesday 1st January for everyone over in the US and Canada. Happy New Year Penguins! Waddle on! I'm not sure if you still do tips or not but Rookie has sent us an EPF message. Wow, still doing this? Aren't you like 18 now?